Minatour controls Offer simple operation. Accu-Chill temperature management system Features built-in sensors that monitor internal temperature levels and activate the compressor when necessary for efficient cooling. 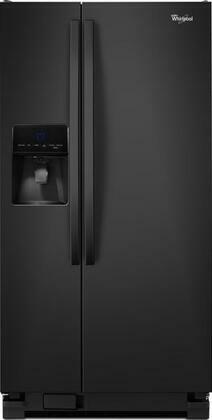 Thru-the-door ice and water dispenser Offers filtered water and clear, crisp ice at the touch of a button. Lockout feature disables the controls to prevent unsupervised use. Flush design provides a sleek look. PUR base grille water filtration Removes impurities for clean, fresh-tasting water. Water filter indicator alerts you when the filter needs to be replaced. Adjustable Spillguard glass shelves Allow you to customize the fresh-food compartment's interior to suit your needs and help contain small spills for easy cleanup. Humidity-controlled crisper pan Helps preserve fresh fruits and vegetables. Snack pan offers easy access to your favorite treats. Meat pan keeps food items organized and within easy reach. Gallon-size door bins Can be adjusted to suit your needs and accommodate large containers to free up shelf space. Clear design makes it easy to find food items. Removable EZ-Tote door bins With handles allow you to easily carry condiments and more to the table. On-demand pulsed defrost system Simplifies freezer maintenance. Wire freezer shelf Along with a plastic freezer bin provides space for storing frozen foods. LED interior lighting Illuminates the fresh- and frozen-food compartments, so you can easily locate food items.